Chinese Chicken – All Sour, No Sweet! You Are Here: Home » Blog » Chinese Chicken – All Sour, No Sweet! We Azmiri-ans have a love of good Chinese food — we celebrate each team member’s birthday with a “family” lunch featuring the honored team member’s choice for lunch and more often than not, they choose Chinese food. It’s relatively healthy and has been feeding America for centuries now. And Chinese medicine? Don’t get us started on the wisdom they have passed on to the western world: herbals, acupuncture, and healing modalities we use frequently. Same goes for art and culture. But as the saying goes, you don’t have to love the government to love the country, people, or the culture. And, unfortunately, the Chinese government is not something we’re fond of. From human rights, to environmental pollution, to poisoned food (the 2007 Melamine pet food recall tops our list of atrocities) we just don’t trust them to keep their food supply safe — not for their own citizens and much less for those they export to. 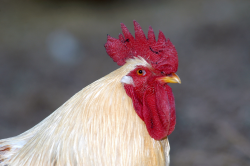 And then, our own USDA, tries to sneak in a loosening of the regulations meant to safeguard us by allowing the importation of Chinese chicken (Read all about it here, here and here). If you aren’t concerned, you should be. Our question is this: Whom do you think this chicken is meant for? Who has the most to gain from poorly sourced, sure to be cheaper than domestic chicken — isn’t that what nearly all Chinese imports offer? Cheaper prices? — produced on non-regulated with poor safety record farms? With more and more Americans demanding accountability and locally sourced product for their dinner table, it’s unlikely you’ll find this chicken at your local grocer. No, there’s too much attention being directed there. Our greatest fear is that this chicken is headed for your low-income neighbor or your pet’s food bowl or favorite treat where there is no requirement to reveal where one of 50+ preservative-laden ingredients are sourced. Particularly if you make the mistake of feeding a food made by a mass-producer who is unconcerned with quality of ingredients as the source of health. And think again if you think a “Made in the USA” label will guarantee your dog food is free of the possibly tainted chicken; “Made in the USA” only refers to the actual manufacture of the end product, not where the parts come from. More than ever, getting a food or treat you can safely feed your pet or even your family, if you aren’t fortunate enough to have the budget for fresh food, will rely on trust. And trust can’t be bought, it must be earned. Think long and hard before you just grab whatever food is on sale. Ask a few questions, directly of the manufacturer, if you can get an answer from them. Consider their track record. Read the label, carefully. And, Good Luck American Consumer! I’ve been through the site and other than a few 2017 comments on the blog, most information that is date is either 2007 or 2013. I know the Canned food was just listed as approved by Whole Dog Journal, but I’m not at all sure of the products nor even if Dr. Newman is still around. I wanted to call this information to my vets’ attention, but I don’t quite know what all to say. I trust they would call and find out though. We take your privacy seriously, so you can rest assured that the information you provide below will only be used for the purpose of leaving comments on this blog post. Your information will NEVER be loaned, rented, or sold to anyone. P.S. REQUIRED fields are bold and marked with an *.